The WAIT LIST for 2019-2020 NEW Assisteen Members is open NOW! New Assisteen Members are accepted in June depending on class availability. To put your name on the Wait List for 2019-2020 please CLICK HERE. you may also contact the Assistance League of Santa Ana at 714-664-0547 or admin@assistkids.org. 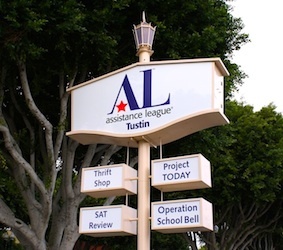 Assisteens is an auxiliary of the Assistance League of Tustin. Both Assistance League and Assisteens have been serving our community since 1965. Our 2018-201 membership includes 8th-12th grade boys and girls who attend a variety of area schools and is 325 members strong. Assisteens volunteer in the Thrift Shop three or more times per year and this revenue funds philanthropic programs. Tustin Area Council For the Fine Arts: Broadway in the Park. The group also has fun social events (including the annual holiday party and grade level events) to help Assisteens get to know Assisteens from different schools. Each June, the Assistance League of Tustin hosts the Rose Medallion, a formal dinner and presentation event, to recognize the graduating seniors and honor all Assisteens for their work.